The Difference ANABOL MAX Extreme Potency Raw Testosterone Bodybuilding Capsules. ULTRA HIGH POTENCY PRO ANABOLIC RAW TESTOSTERONE ENHANCER. If you have tried other testosterone or muscle building supplements and have been disappointed then this is the product for you MAXIMUM POTENCY – MAXIMUM GAINS – NO COMPROMISE Formulation. This is why THE DIFFERENCE is well …. different! The ingredients are fresh, maximum legal potency, pro grade and blended to produce an enhanced synergistic effect that will take your muscle gains to the next level. As used by leading bodybuilders, Rugby Players, Gym Users, Athletes, Fighters and anyone looking for enhanced physique development. 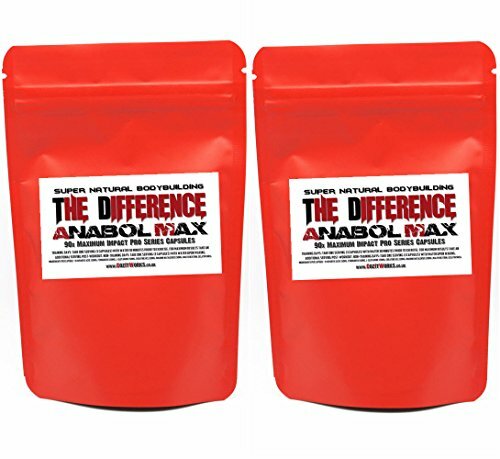 You will feel & see THE DIFFERENCE ANABOL MAX in as little as 21 days. THE DIFFERENCE between winning and losing, THE DIFFERENCE between making real muscle gains and getting nowhere. Each Pro Series capsule is a maximum impact synergistic blend of pharma grade D Aspartic Acid 150mg, Fenugreek 150mg, L-Glutamine 150mg, Creatine HCL 150mg, Bulbine Natalensis 150mg. 90x Enhanced Quality Capsules per pack. Designed and formulated to turbo charge the results of hard training athletes looking for extreme lean muscle enhancement. This product responds best to very high intensity training to provide maximum stimulation of the muscle fibres which in turn can be translated into accelerated growth – that is THE DIFFERENCE – ANABOL MAX. BUY ONE GET ONE FREE = 2 x90 = 180 Caps!